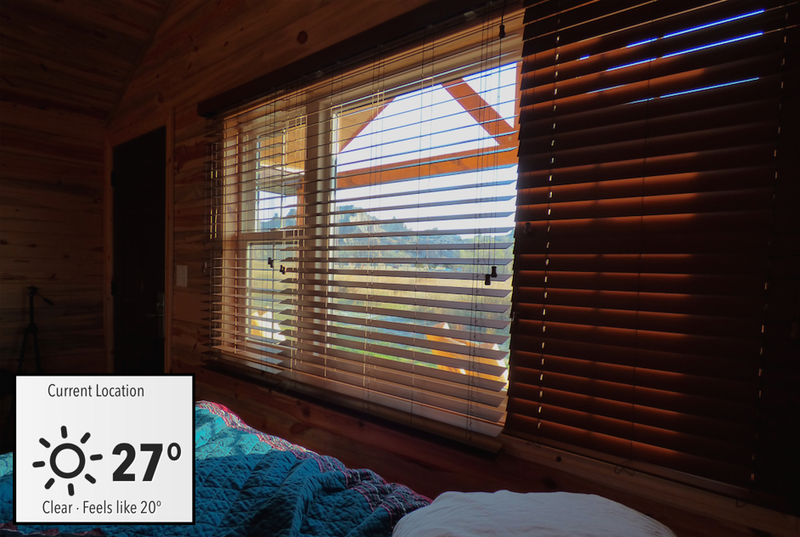 I woke up in our cabin at Cedar Pass to gleaming sunlight sneaking through the cracks in the closed blinds and the realization that I didn’t have to hurry to do anything. Based on our experience arriving at the park last night, it appeared we were the only humans around for miles aside from the lodge employees, and since we had abandoned our plan to camp and were instead staying in this cabin for our entire trip, there was no rush to secure a campsite or get out on the hiking trails early to avoid crowds. Plus, although the sun was shining brightly, I could hear the menacing wind outside, and a check of my phone’s weather app revealed that it was 27ºF. I twisted the blinds open so I could see the formations behind the cabin while I continued to lay in bed and enjoy being lazy, something I’m not accustomed to doing on my usual vacations. It was below freezing outside, the park was deserted, and as excited as I was to get out and explore the landscape, I was in no hurry to do it before 10am. I was careful not to let my senses get me down by fooling me into thinking it was only 20º when it was actually a balmy 27º. And yes, I took a screen shot of the weather as a memento. Once we were ready for breakfast, we walked from our cabin to the Cedar Pass Restaurant and took in our surroundings. Ours was the only car at the cabins, and cottontail rabbits were enjoying the use of it as shelter from predatory birds. During our stay here, the rabbits hung around outside the cabins, not the least bit bothered by us, but constantly on alert for non-human threats in their exposed habitat. The restaurant and gift shop were quiet, and we sat at a table by a window looking out on a tall pinnacle across the road. I chose the Indian Fry Bread with berry pudding, which was very good. We planned to take a couple of short hikes today, followed by some scenic driving within the park (details will follow in Part 3). After breakfast we drove to the parking area where four of the park’s established hiking trails are accessed. There was one other car in the parking lot, and the wind was the only sound. The sky was still clear and the sun was bright, but the wind was cold and intense. At the beginning of Notch Trail, a sign warns of rattlesnakes, which are common in the park. We would have liked to have seen one from a safe distance, but it was a bit too early in the season and too cold for them to come out of hibernation yet. We were wearing hats, gloves, and multiple layers under puffy jackets as we set off on Notch Trail. 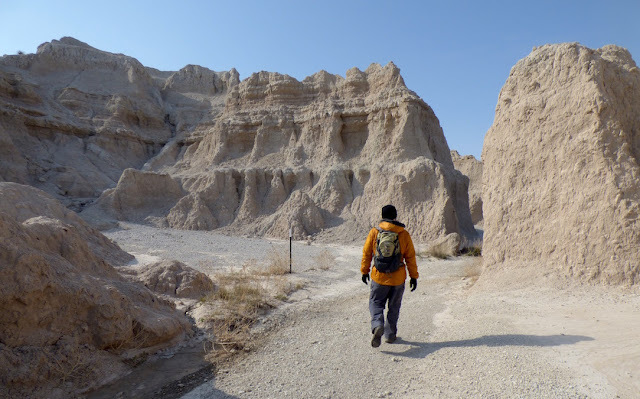 The trail traverses a dry grassy area to an opening in the Badlands Wall - a major formation in the park that spans approximately 60 miles east-to-west and is made up of a continuous series of buttes and spires. It was like walking into an extraterrestrial ghost town. Notch Trail is short but very interesting. 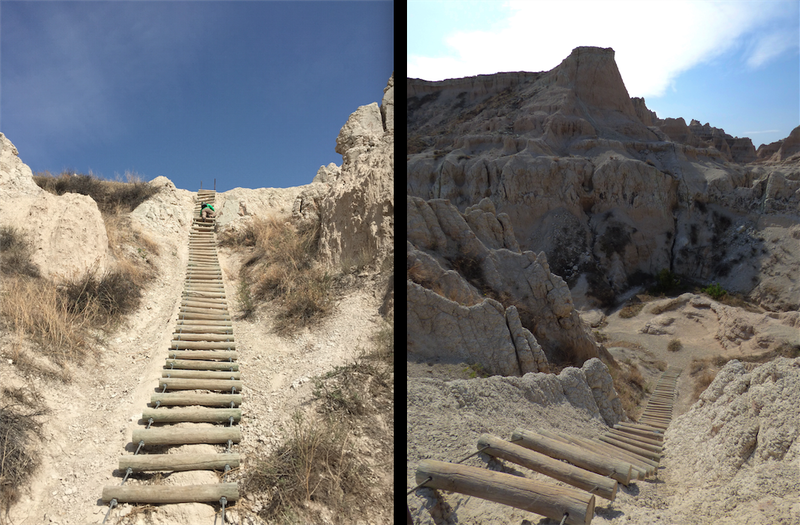 The path winds through a canyon before climbing up the face of the formation using a long, steep ladder made of logs. 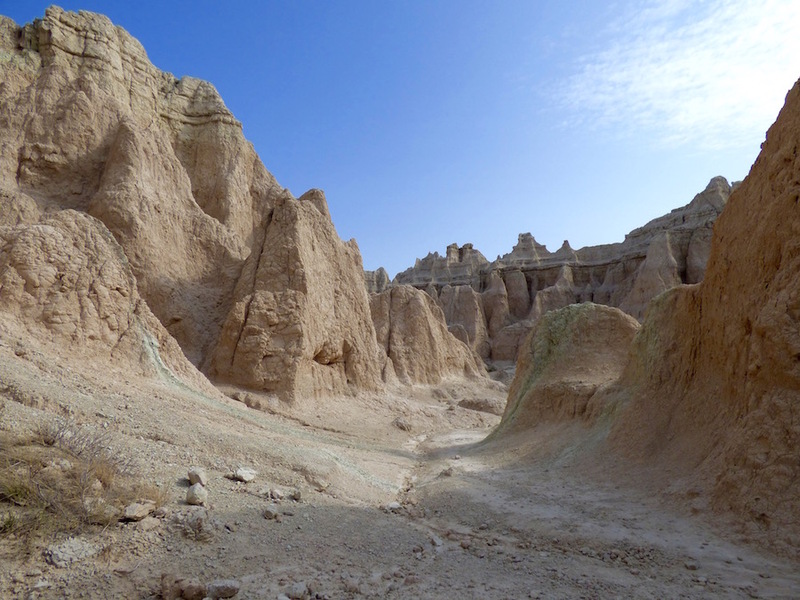 The trail then continues at a higher elevation, where hikers are immersed in the dramatic alien landscape. The trail ends at an abrupt drop-off with a view of the White River Valley. This is an out-and-back route, so hikers are given the opportunity to see everything again on the way back. The trail is only a mile and a half round-trip, and we were done in under an hour. Notch Trail: Looking down at the valley after climbing the ladder, which can be seen on the left. Left: Hiking the upper part of Notch Trail. Right: The view of White River Valley at the end of the trail. 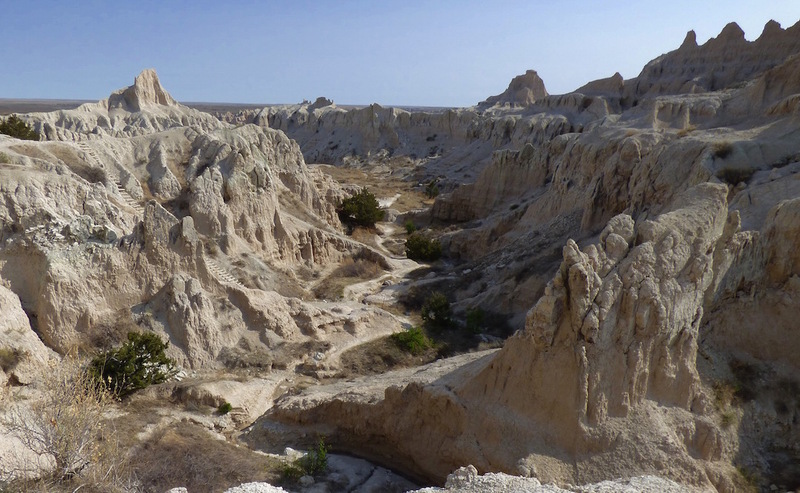 500,000 years is the blink of an eye in geologic terms, and up close it is easy to see how fragile this sedimentary landscape is. It is eroding at a very fast pace – about an inch is weathered away each year by rain and wind. 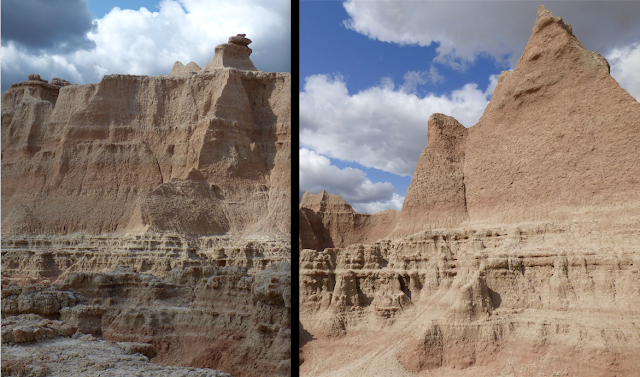 Eventually the Badlands formations will disappear. Scientists estimate that at the rate the formations are eroding, it will be only another 500,000 years before they are gone. 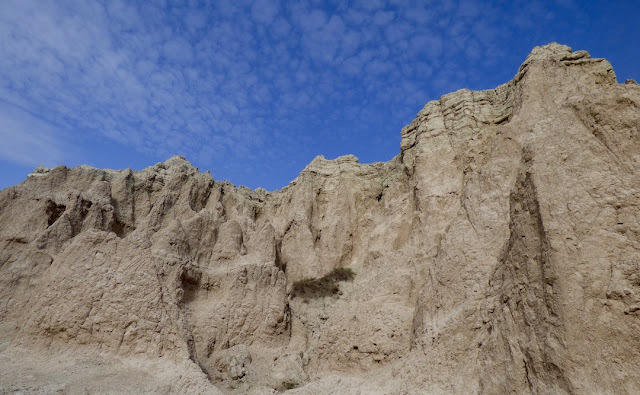 It becomes clear how short the Badlands’ lifespan is when compared with the Grand Canyon, parts of which recent research suggests may have begun forming as early as 70 million years ago. Back at the trailhead, a flash of bright blue caught our eye. A mountain bluebird was perched at the tip of a low branch of a dead shrub, the soul inhabitant of the parking lot, swaying side-to-side in the strong wind (hence the blurry photo). I have never seen a bird that blue, and its color appeared especially striking due to the change in the sky. 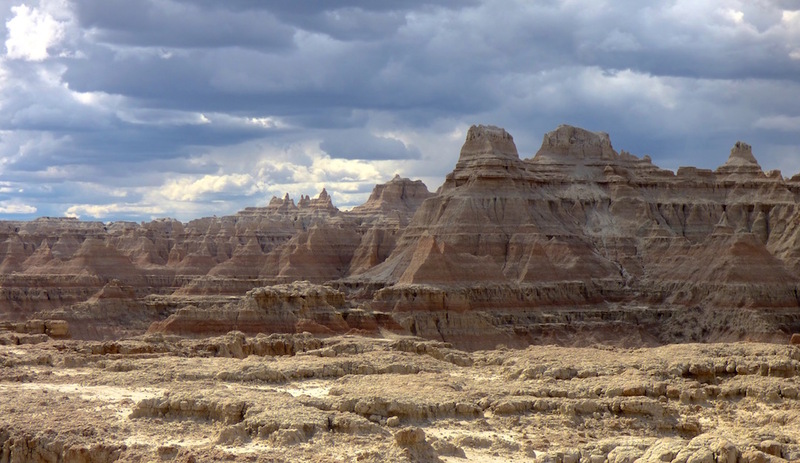 Steel gray clouds were gathering, providing a dramatic backdrop for the scenery on our next adventure: Door Trail. Here, visitors are led at first along a boardwalk through a “door” in the Badlands Wall. The boardwalk was installed around 2000 to protect the path from rapid, human-caused erosion. Once through the “door,” impressive layered buttes and turrets rise in the distance, and hikers can venture out onto the rugged desert terrain, with yellow trail markers as a guide to prevent getting lost. Photo taken by Craig on Door Trail. Note the firm stance and the fabric of my pants plastered against my legs by the intense wind. If the wind hadn’t been so overwhelming, I could have spent most of the day wandering around this area. It was spectacular. The striking features against the dramatic sky resulted in many of our photos looking fake, like an intensified cloudy sky was Photoshopped behind the formations, and our brightly-clad figures digitally dropped in front. After Door Trail, we drove north to take in the view at the nearby Big Badlands Overlook before returning to Cedar Pass and embarking on the scenic driving we had planned. 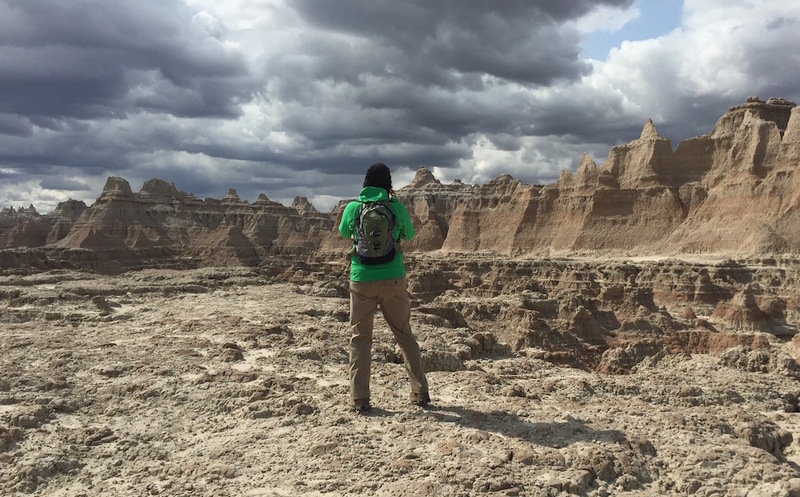 The first overlook when driving east-to-west through the park, Big Badlands Overlook offers a panoramic view of miles of banded rock formations. As we returned to Cedar Pass, we noticed movement in the tall grass ahead of us. 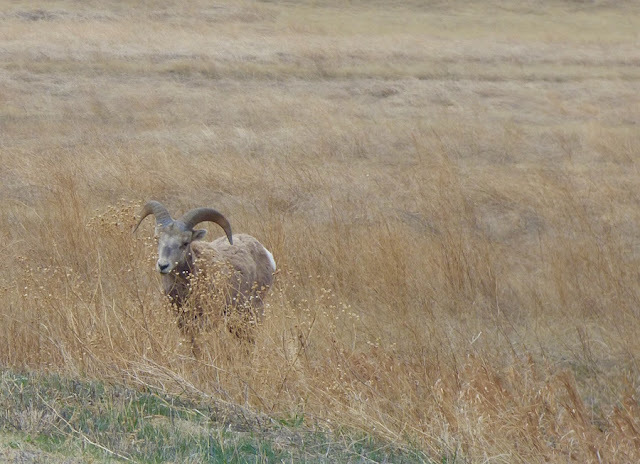 It was a group of four male bighorn sheep, and I pulled to the side of the road to watch them, thinking maybe I would be lucky enough to get a few photos from far away with my zoom lens before they disappeared. Because the park was all but deserted, there were no other cars on the road, and we didn’t have to worry about holding up any traffic. (Not a single car passed us during this time.) The rams walked slowly through the tall brown grass toward the road, where they began grazing on the short green grass that grew along the road’s edge. 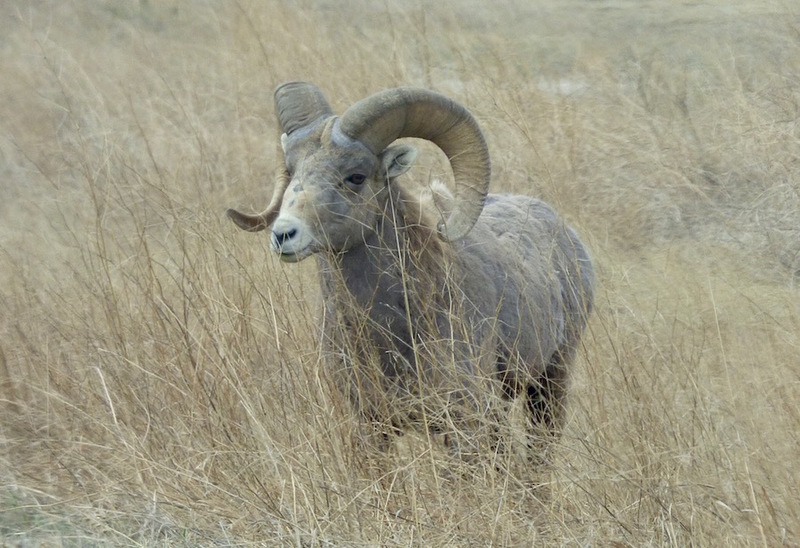 Of the four, one appeared more mature; he was larger, with more substantial horns showing some dark age rings. 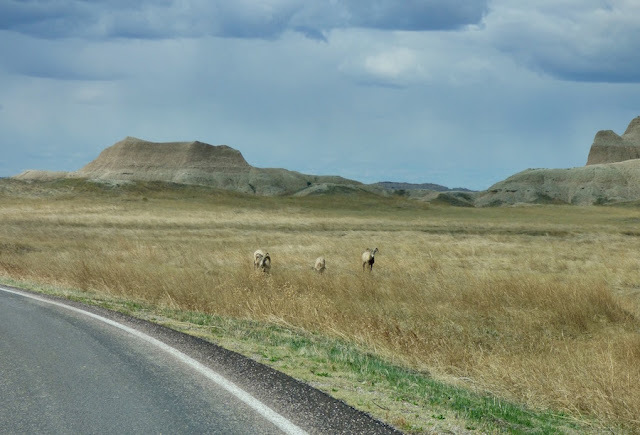 We did not intend to purposely get closer to them, but as we sat quietly watching, the rams strolled along the edge of the road toward our parked car, heads down and grazing most of the time. They came closer and closer, eventually walking past us just outside the passenger door, paying us no attention whatsoever. Being able to stop the car and observe animals was one of many pay-offs we would receive as the park’s only human inhabitants during this cold visit. 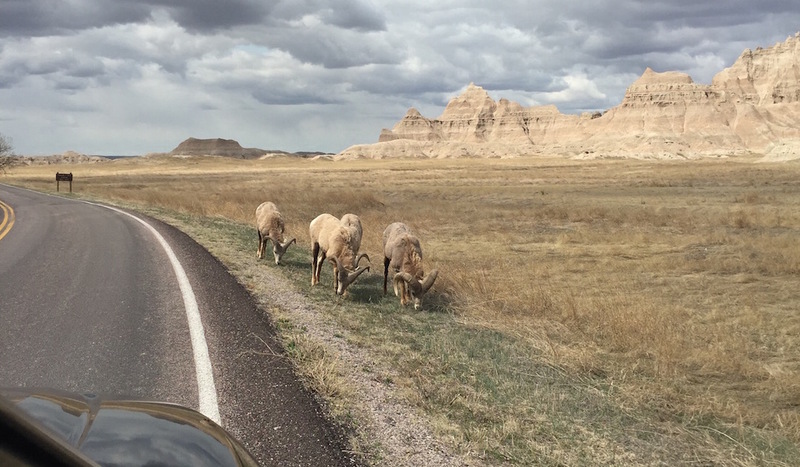 For a video of these rams walking past our car, go here. 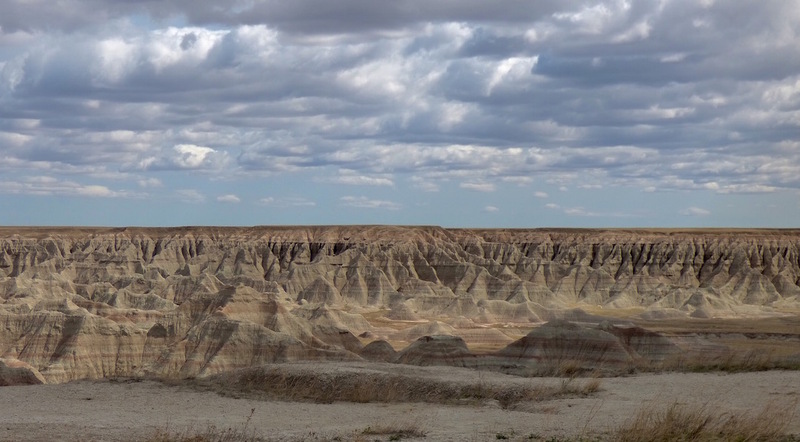 I'd love to go to the Badlands, it looks like such a distinctive experience, away in the wilderness!